Tennessee is one of the state that has “one party consent” law when it comes to recording phone calls. According to Tenn. Code Ann. 40 – 6 – 303, it is a crime to “intentionally intercept any wire, oral or electronic communication to overhear or record a phone call or conversation unless one party consents to the recording of the conversation.” With this statute, it implies that you are free to record a phone conversation to which you are one of the parties but it doesn’t allow you to record a phone conversation to which you aren’t a party. The essence of having the law as one party is to keep away any other parties who are not part of the conversation from recording the call. This is not only useful in saving employees from being spied upon by their employers but also it protects spouses from being spied upon by their untrusting partners. The law only applies to when recording calls within the state of Tennessee alone. If for instance you need to record an interstate call, then additional factors must be considered. For instance, you must consider the wiretapping laws of the other state and ensure that you are not in violation. As a safety precaution when dealing with interstate calls, it is recommended that you obtain consent of all the involved parties so that you adhere to the federal laws as well as the wiretapping laws of the concerned states. You can see a list of the recording laws by state. Again, the wiretapping laws in Tennessee do not specify the exact means of recording phone calls. This leaves it at your discretion to choose the most appropriate but legal means to record the calls. Secure Speak is one of the easiet ways to get high quality recordings. Secure Speak gives you a phone number that you can use to 3-way into any call. Whatever that line hears gets recorded and sent directly to your email address immediately after the call ends. 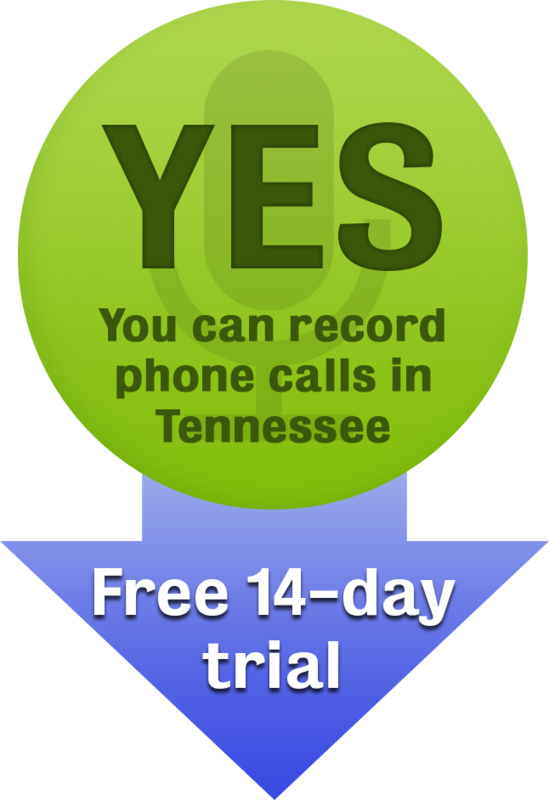 Take advantage of the 14 day free trial period to test out the effectiveness of using Secure Speak to record phone calls in Tennessee. Secure Speak is not a licensed lawyer and any statements do not constitute legal advice. Contact a lawyer for information pertaining to your specific case, and reference Tenn. Code Ann. 40 – 6 – 303 directly.